Keeping our skills sharp and staying up to date with auditing technical knowledge and certification best practices is really important to us. 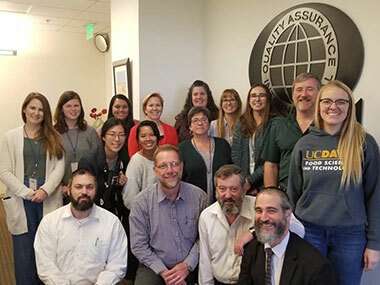 So this February, QAI and NSF International (our parent company) staff and food safety inspectors underwent IOIA processor inspector training with instructor Luis Brenes. This insightful training session included the fundamentals of processor inspection requirements and we challenged each other to address specific client issues and add further context to general coursework. It was really interesting seeing the issues from our different perspectives of certification project management and food safety inspection experience, and Luis’ decades of organic experience. We learned more about linking the daily realities of production facilities and the inspection process with the compliance documentation we are sent each day. Our in-classroom training also included a mock inspection and report writing process that demonstrated the role of inspectors in the organic certification process in a dynamic hands-on environment. We’re excited to put our new skills and knowledge into practice by providing you with better inspections and customer service.